This morning we decided to grab breakfast on the way into magic kingdom. 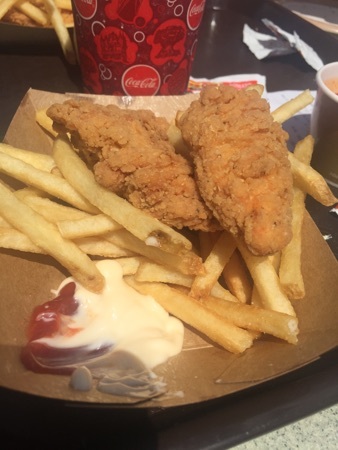 We tried Cracker Barrel, IHOP and Waffle House on the 192, all had a half hour wait or more, so we decided to just head to magic kingdom and have an early lunch. 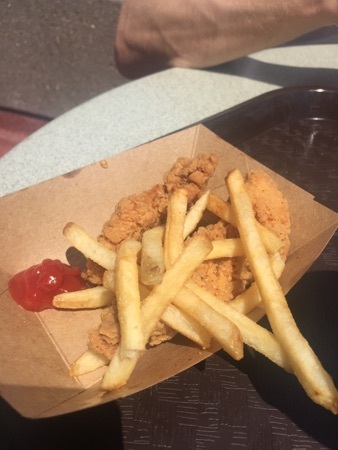 DD and I shared the adult chicken strips and fries from tomorrowland terrace, this was $10.99. It came with a side of dipping sauce, I chose Buffalo. It was pretty spicy! This is my share of the portion. And this is DDs share of the portion. There was plenty for us to split! 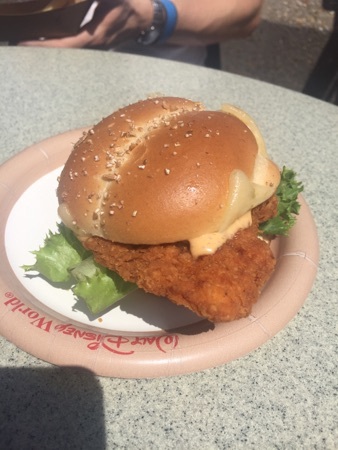 DH had the spicy chicken sandwich, this came with a portion of fries too. This was $9.99, DH said it wasn't particularly spicy but he really enjoyed this, said it was lovely! We also got a Coke Zero with our meal to share so the total came to $25 with tax. Mid afternoon we got DD a snack from Main Street confectionary. 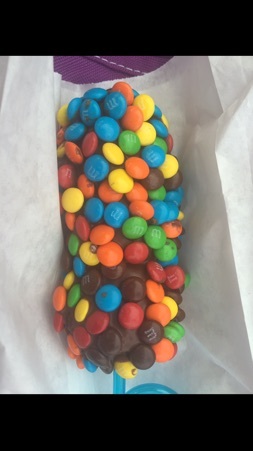 This was the marshmallow wand dipped in milk chocolate and m&ms. These are so good! DD managed about half so I finished it off! This was $4.99. For dinner we headed to Panera bread near the premium outlets at Vineland. This is a new place for us. 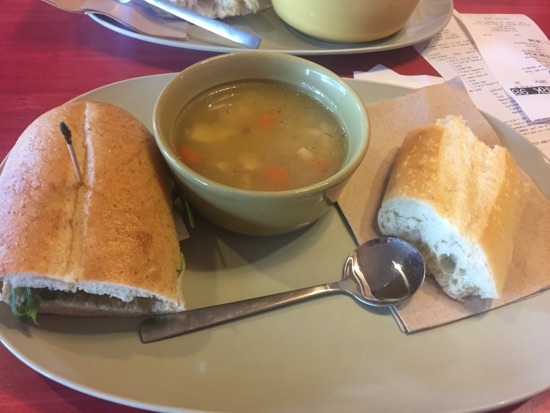 DD had the chicken noodle soup and a piece of baguette and I had the Italian sandwich. DD really enjoyed the soup and there was loads of pieces of chicken. My sandwich was really good and was a welcome break from all the rich food I'd had recently. 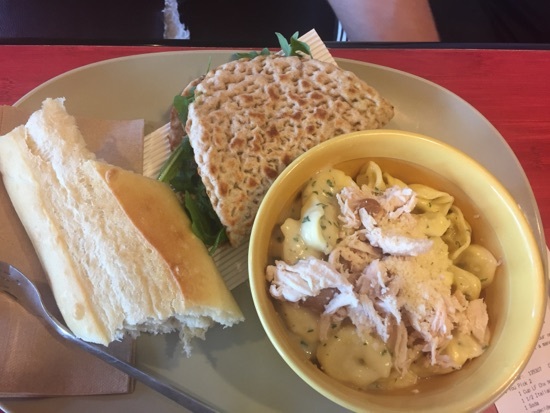 DH had the chicken pasta Alfredo with a tomato and mozzarella flatbread. This also came with a baguette. DH really enjoyed this and although the portion seemed small when it arrived there was a lot more than there looked and DH struggled to finish it. We each got a soft drink and it came to a total of $31. Panera bread was a nice change from the usual food we have and somewhere we will definitely come back to. Tomorrow we check in to the Polynesian for a couple of nights on the deluxe dining plan. New Photo Added by missdopey - 17 Apr 17 2:29 AM. More good food, Panera Bread looks like somewhere worth a visit. Panera bread looks like a lovely change.